SHEHJAR - Web Magazine for Kashmir :: So you do not want to return permanently to Kashmir, what's next? So you do not want to return permanently to Kashmir, what's next? *- Vijay K. Sazawal, Ph.D. Many years back I wrote an article for a monthly community journal from New Delhi in which I said that it is our collective fate that we should spring from the valley and then leave it for good to do better elsewhere. This paradigm is unlikely to shift soon. But it is a myth to believe that we can continue with Pandit culture and heritage (beyond 3 or 4 generations) unless the culture is constantly replenished from the source in terms of continuing migration of Pandits from the valley. We need to protect the source – the land that Rishi Keshyap dedicated for a civilization and culture as unique as ours. We must not waiver from our commitment to save the source and all those Pandits who are living there today. Because what is there today will be tomorrow’s infusion in societies far removed from Kashmir so that everyone – no matter where they live - feel every bit a part of the land of the Vitasta. 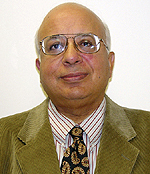 *Dr. Vijay K Sazawal is a nuclear policy specialist by profession, having worked for over three decades in the U.S. nuclear industry. His professional experience covers the entire nuclear fuel cycle, having worked on breeder reactors, space based reactors, advanced reactor designs, spent fuel management, reprocessing, and nuclear enrichment. He is currently a senior executive in a global energy company. Dr. Sazawal also writes on regional security issues in South Asia with primary focus on Kashmir. His papers have been published in both U.S. and foreign publications.